Spinach is a green, leafy vegetable that is rich in vitamin A -- and when you cook spinach, its vitamin-A content more than doubles. The amount of iron in spinach also increases after you cook spinach. One way to prepare spinach is to saute it. 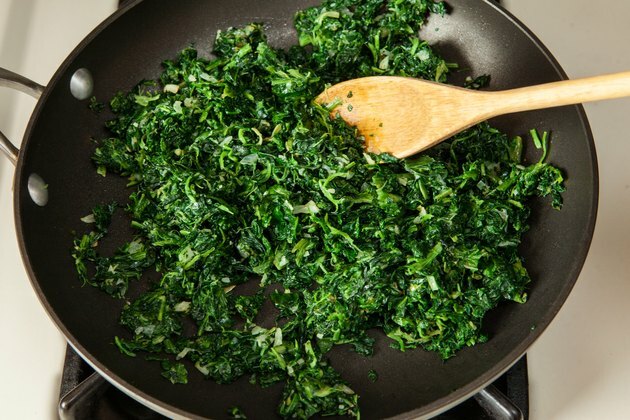 Serve sauteed spinach as a side dish. Allow yourself extra time when you make this dish, since you must thaw frozen spinach before you can saute it. 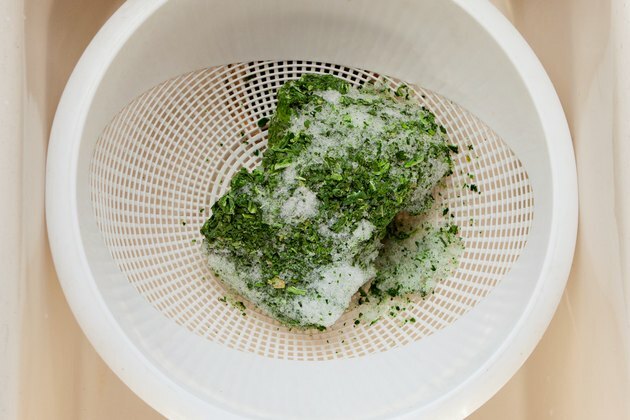 Place a large colander in the kitchen sink and pour the frozen, chopped spinach into it. Cover the spinach with a pot cover or dinner plate to keep out any airborne debris. Wait about two hours for the frozen spinach to thaw. Squeeze the water out of the spinach with your hands, and then place the spinach in a medium-sized bowl. Wash your hands with soap and water before doing this. 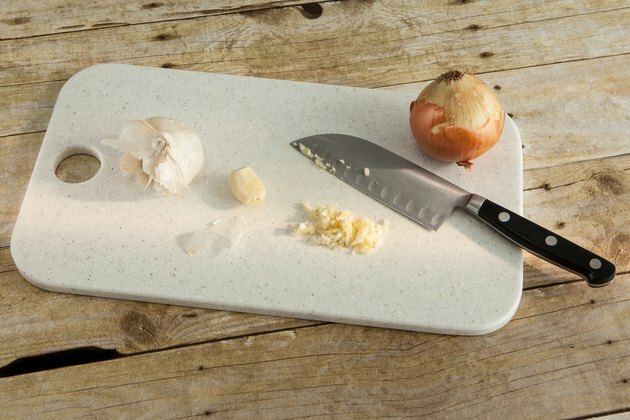 Remove the skins from the garlic cloves and place the cloves on the cutting board. Mince the cloves with a small, sharp knife. Do the same with the onion. Put the olive oil, or the butter, in a medium-sized pan, and place the pan over a medium to high heat. Wait for the oil or butter to get hot, and then add the minced garlic and diced onion to the pan. 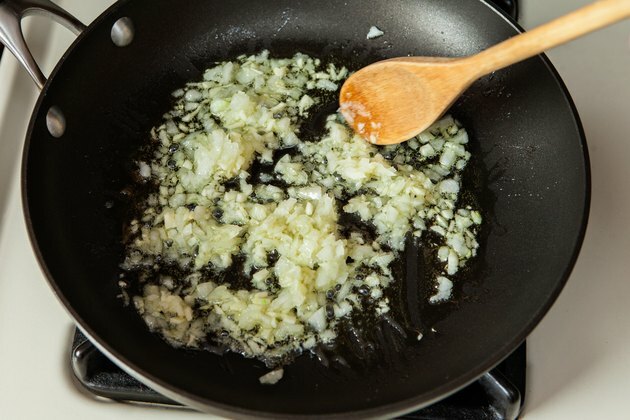 Saute the garlic and onion until they are soft, roughly two minutes. Put the spinach in the pan and saute the garlic, onion and spinach for 60 seconds. Give the spinach one quick stir after 30 seconds. 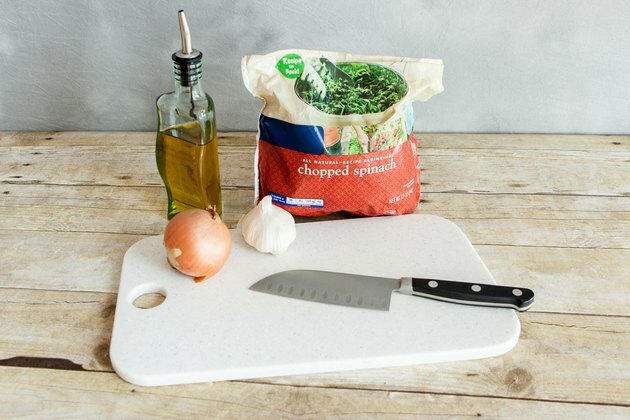 Remove the water from the thawed, frozen spinach by pressing the spinach against the sides of the colander with a soup spoon if you'd rather not touch the vegetable with your hands. 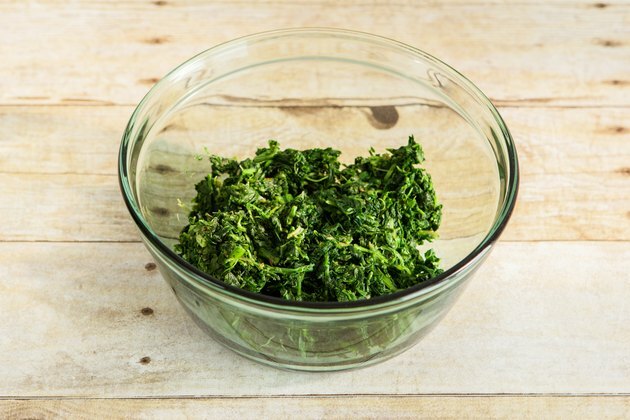 You can also press the water out of the spinach by placing a bowl -- or a small, flat dish -- on top of the spinach in the colander and applying pressure to it. Add a little salt to the sauteed spinach if desired. Spice sauteed spinach with a pinch of red-pepper flakes, or black pepper.